Complaints from residents and businesses along with videos of reckless behavior by scooter operators during this year’s Spring Break have Miami Beach Commissioners scrambling to come up with a solution before the next high impact weekend – Memorial Day. Commissioner John Aleman is sponsoring an ordinance to prohibit the rental or lease of motorized scooters and mopeds during the month of March and Memorial Day Weekend each year. This was Aleman’s second attempt at the ordinance. Commissioner Michael Gongora called it “well-intended”, but raised the same concerns he did when Aleman brought the issue to Commission a couple of weeks ago, ultimately withdrawing it to return with a more narrowly defined piece of legislation. Gongora said he was concerned that local businesses would be penalized while businesses in Miami could still rent the scooters to tourists who would simply drive them over the bridge to the Beach. “If it’s not going to solve the problem, I certainly don’t want to penalize our local businesses” but he said he would support the ordinance on first reading and hope to hear from impacted businesses at the next Commission meeting. Commissioner Ricky Arriola said he was a “no”. Agreeing with Gongora he said, “It’ll penalize local businesses. We’re basically taking away their busiest weekends and month for business and I don’t think it solves the problems” citing Aleman’s videos which showed bicycles and motorcycles being operated unsafely, too, and what was “clearly a skilled rider” on a motorcycle who “probably had his own cycle” and was comfortable performing the tricks he was doing in traffic. “It’s a good sounding ordinance but I don’t think it’s going to solve the problem,” he said. Aleman asked Arriola to first hear testimony from Miami Beach Police Chief Dan Oates and members of the public before making up his mind. Oates told Commissioners, “In terms of enforcement, this is a challenge for us.” During the month of March, he said police wrote 457 violations for improper driving of scooters during spring break and a total of 898 since the first of the year. “During the height of spring break we couldn’t keep up with the volume of violations,” Oates said. In addition to the time it takes to write a ticket, he said the behavior of the riders – weaving in and out of traffic – makes it hard for police officers to stop a violator, “especially in crowded traffic”. 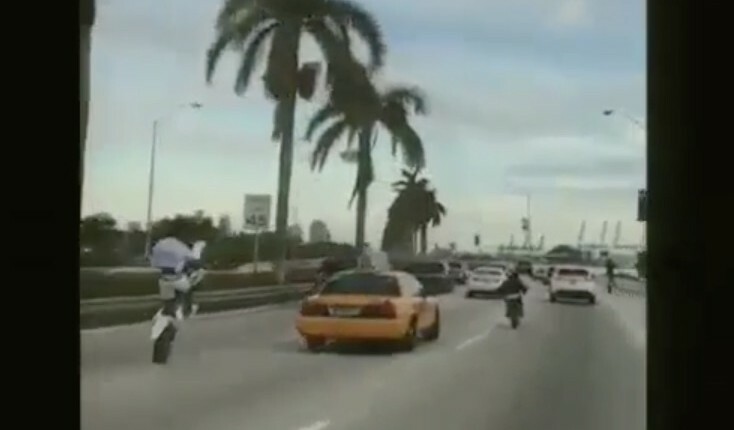 Ocean Drive resident Henry Stoller, said he has witnessed a large number of scooters being operated unsafely while walking down Ocean Drive “in broad daylight”. Mike Palma, chairman the Ocean Drive Association, said his board “unanimously agreed this is the right move”. “A lot of these businesses that come and do the rentals on these busy high impact periods bring extra bikes and mopeds in and … that inundates us with an excessive amount of scooters and bikes and two wheelers and three wheelers,” Palma said. “We’re pro-business, but it’s the right thing to do,” Palma said of the proposed restrictions. After lobbyists for Lime Bike and Spin urged caution on not impacting mobility solutions utilized by commuters, Aleman said that was not what the ordinance would do. “Given the speed, which I understand because of the schedule [of the approaching Memorial Day Weekend], we’ve not had time to deliberate,” Samuelian said. “We’ve not heard from the businesses.” He wanted to ensure the City informs affected business owners so the Commission can hear from them on second reading. Finally, Samuelian asked for “some measurement that we can see how we’re doing … accidents, number of citations, so that we can gauge whether this was truly effective”. The vote was 5-1 in favor with Commissioner Arriola voting no and Kristen Rosen Gonzalez absent. To see the video of the discussion and scooter violations, click here.